Temperature | please select from the sub categories below. Everything you need for the measurement, control and monitoring of temperature for industrial purposes can be found here with DG Instruments range of temperature instrumentation. We stock accurate and reliable temperature instruments including switches, thermocouple, sensors, gauges, controllers and transmitters, from leading brands such as United Electric Controls and Red Lion Controls. Browse the subcategories below for products, or contact us at DG Instruments for enquiries. Collection of temperature switches from United Electrics including general-purpose switches for almost any application, with numerous outputs. 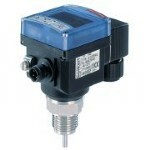 General-purpose temperature indicating transmitters, suitable and adjustable for varying applications with enclosed digital indication. Accurate and reliable temperature gauges suitable for any application or industry to measure varying levels of temperature. Digital temperature controller units with various thermocouple temperature probe inputs from leading manufacturers like Red Lion Controls. Choose from Resistance Thermometer Detectors (RTD) and Thermocouples for an appropriate sensor to measure heat for your needs. Easy to use infrared thermometers - which infer temperature from the thermal radiation emitted, with digital display options. Simple to use and economical, dial thermometers are ideal for everyday use over any number of applications as indicators of temperature. Thermowells to protect temperature sensors for industrial purpose, with varying sizes and mountings to suit specific needs.